I was concerned going into Hook & Ladder Manufacturing Co. for lunch today. Before the start of the Great Sacramento Vegan Burger Battle, the Impossible Burger at Hook & Ladder was my very favorite burger in town. The Jule's cheese sauce, sautéed mushrooms, and especially the whole grain mustard really made that burger, and I seemed to be in there every week to get my burger fix. So I was worried that I wouldn't like burger they'd created for this month's burger battle. It couldn't possibly be as good as the other one, could it? The answer is yes, it could and it is. The patty is still the Impossible Burger, but the other goodies on the bun are vegan mayo, pickled red cabbage, and smashed avocado. If you'd like a little heat with your burger, you can add pickled Fresno chilies for a dollar. I wasn't that brave, but the burger didn't need them. It was fabulous without the chilies. Hook & Ladder is located at 1630 S Street, and their phone number is 916-442-4885. Their website address is https://hookandladder916.com/, and their Facebook page can be found at https://www.facebook.com/HookandLadderSacramento/. The restaurant is open Monday through Thursday from 11:30 a.m. to 9:00 p.m., Friday from 11:30 a.m. to 10:00 p.m., Saturday from 10:00 a.m. to 10:00 p.m., and Sunday from 10:00 a.m. to 9:00 p.m.
Oh, my goodness, I just had such a good burger at VEG! 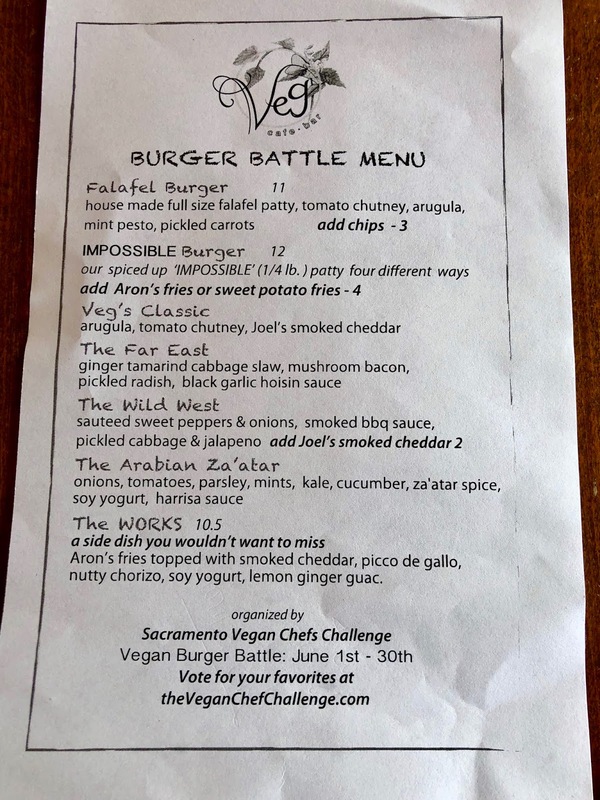 They are offering several different burgers during this month's Great Sacramento Vegan Burger Battle, which made trying to pick just one really difficult. After much deliberation, I chose the Far East Burger, which consists of their version of the Impossible Burger (it has a different combination of spices than other Impossible Burgers I've had), ginger tamarind cabbage slaw, mushroom bacon, pickled radish, and black garlic hoisin sauce, served on a really good bun. 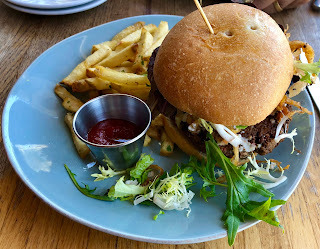 I often find myself poking through my burger because there's something or another that I want to take off of it (usually onions), but with this burger, I loved every part of it. If this one doesn't tempt you, check out their falafel burger, or one of their other three Impossible Burger creations. On my to-do list for today was to visit one of the restaurants serving a Portobello burger for the Great Sacramento Vegan Burger Battle. The Crocker Café, inside the Crocker Art Museum, seemed like a good bet, especially since I'd really enjoyed the smoked Portobello mushroom slices on their tree-hugger BLT when I was there last week. 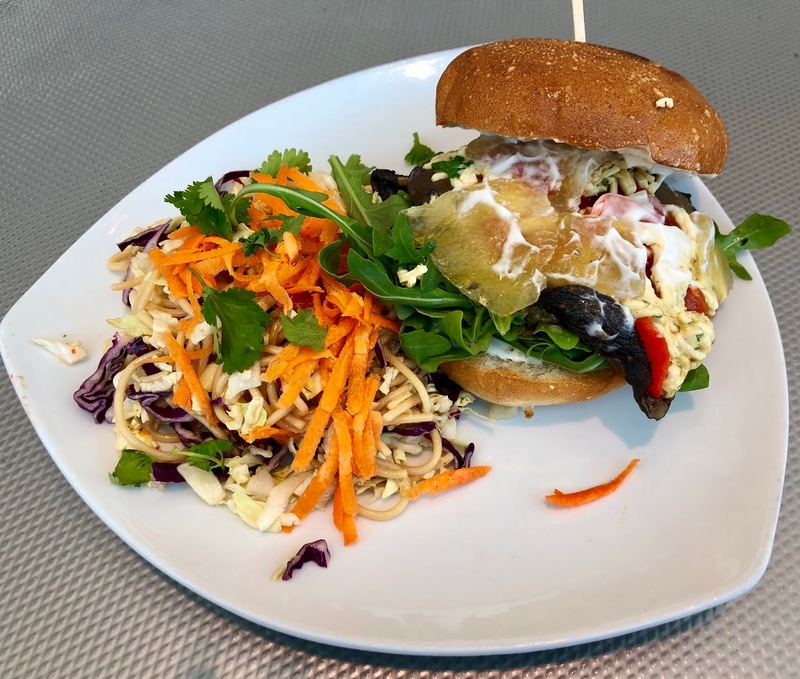 Lunch at the Crocker Café turned out to be a great choice, as I really, really liked their Vegan Crocker Burger. 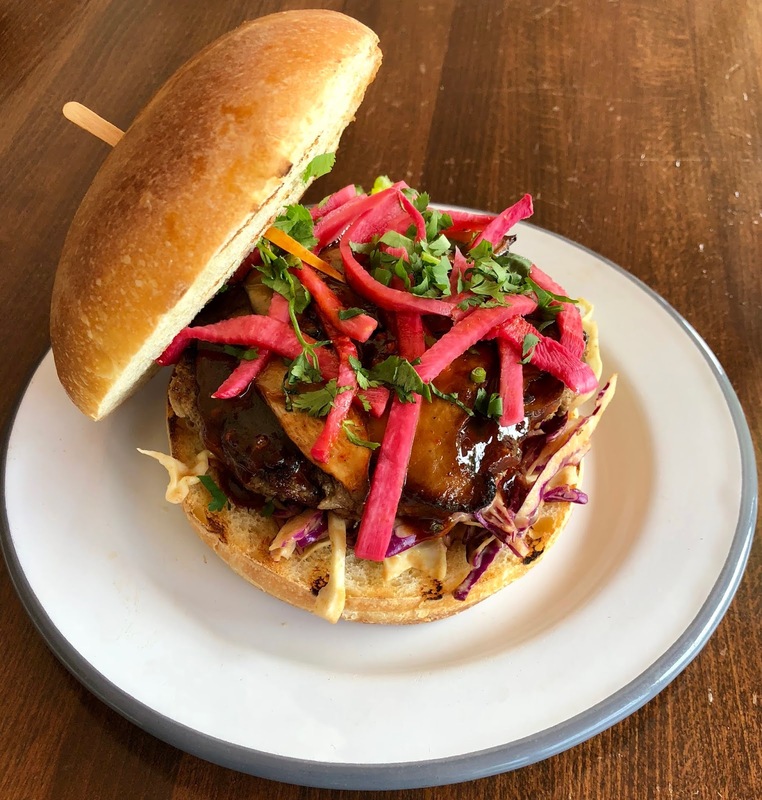 In addition to the wonderful smoked Portobello, there were lots of other good things on the bun -- roasted red pepper, watermelon rind pickle, arugula, chimichurri, Vegenaise, and shredded Daiya cheese. The Asian noodle slaw that came with it was flavorful, if spicy. One caveat: it is not possible to eat this burger without making a gigantic mess, so be sure to load up on napkins when you order it. The two napkins I optimistically picked up weren't even close to enough. You don't have to pay admission to the museum in order to visit the Crocker Café, but you'll have to pay if you want to see the art. I have an annual membership, so I could have stayed to look at the exhibitions after lunch, but I was running short on time. 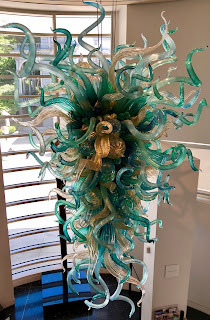 I did take a few minutes to admire the gorgeous Chihuly chandelier right above the entrance desk, though. 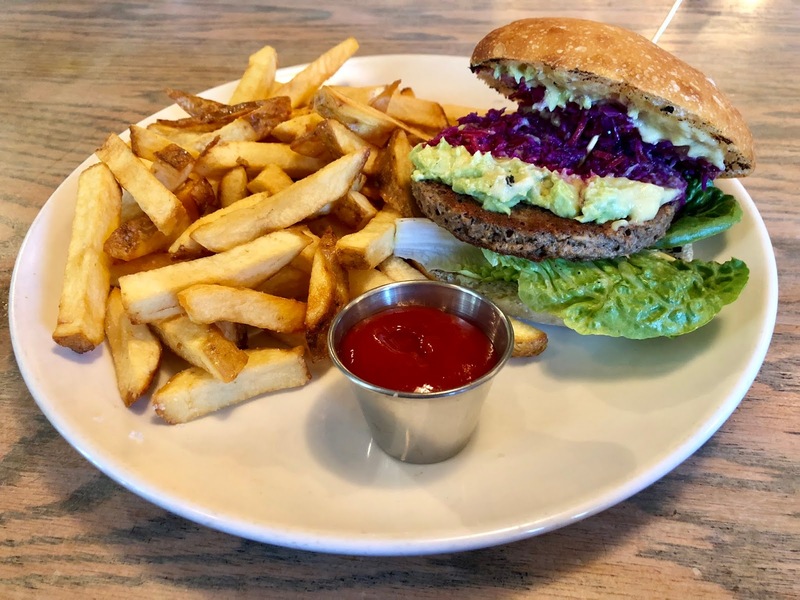 While I could happily eat an Impossible Burger every day during this month's Great Sacramento Vegan Burger Battle, I know many of you prefer house-made veggie burgers. So today, I decided to meet up with my friend Kathy, who writes the Sacramento Revealed blog, to try the house-made burger LowBrau is offering this month. 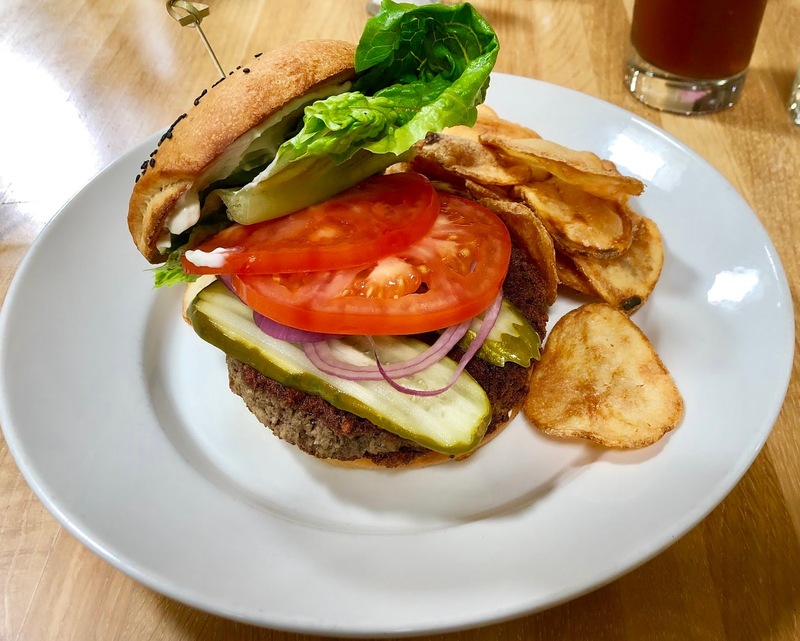 The LowBrau vegan burger consists of a hearty black bean patty, served with lettuce, red onion, bread and butter pickles, almond crema, and chimichurri on a pretzel bun. It was a little on the spicy side, which was fine with me, but if you have a low tolerance for spicy food, you may want to mention that to your server. 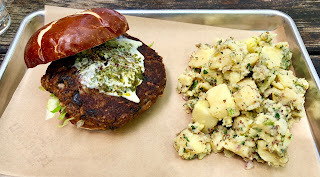 LowBrau has several other vegan items on their menu, including a tasty German potato salad that Kathy and I shared. This was a very satisfying meal. LowBrau is located at 1050 20th Street, and their phone number is 916-706-2636. Their website address is http://www.lowbrausacramento.com/, and their Facebook page can be found at https://www.facebook.com/LowBrauSacramento/. The restaurant is open Monday through Friday from 11:00 a.m. to 2:00 a.m., and on Saturday and Sunday from 10:00 a.m. to 2:00 a.m.
Another day, another Impossible Burger! For today's Great Sacramento Vegan Burger Battle meal, Phil and I had lunch at the Patriot in Carmichael, where they are serving two different versions of the Impossible Burger. 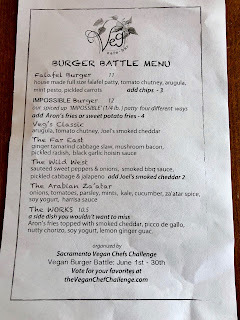 Revolution Wines keeps adding more and more vegan options to their menu, so I wasn't surprised to see that they were participating in this month's Great Sacramento Vegan Burger Battle. They are offering two different types of burgers -- their version of the Impossible Burger and an oyster mushroom banh mi. My husband Phil and I had lunch there today because I really wanted to try their Impossible Burger. It was wonderful -- an Impossible Burger patty, Miyoko's mozzarella cheese crumbles, vegan aioli, crispy onions, and field greens on a vegan bun. I'm a huge Impossible Burger fan, so this is likely just the first of many Impossible Burger posts you'll see this month! 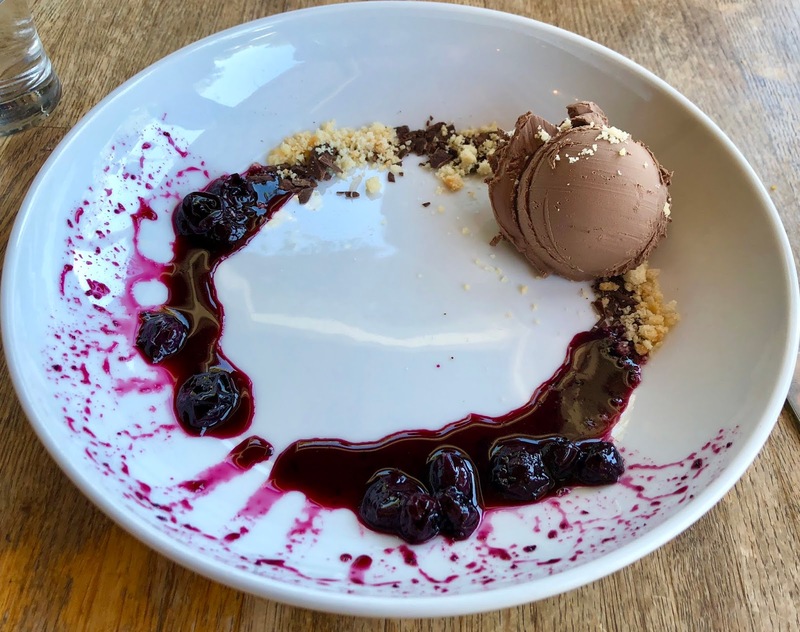 Revolution Wines has two different vegan desserts on their menu too. The peach crisp with vegan vanilla gelato sounded really tempting, but I was in the mood for chocolate. This chocolate mousse was garnished with shortcake crumbles and cherry sauce. It may look small, but after that huge burger, I was happy to split this dessert with my husband. Revolution Wines is located at 2831 S Street, and their phone number is 916-444-7711. Their website address is http://rev.wine/, and their Facebook page can be found at https://www.facebook.com/revolutionwines/. The restaurant is open Tuesday through Thursday from 11:00 a.m. to 9:00 p.m., Friday and Saturday from 11:00 a.m. to 10:00 p.m., and Sunday from 10:00 a.m. to 9:00 p.m.